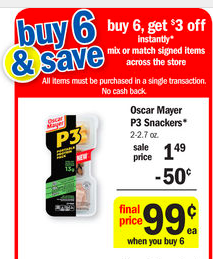 Meijer: ONLY on 7/5 Cheap Oscar Mayer P3 Snackers! Final Price: $0.49 each wyb 6! If you do not have 3 coupons, then mix and match from the sale to get the sale price of $0.99 before coupon!